Anyways, I knew I had to make similar one myself, but alas I could not find any of these beautiful turquoise like the original version. So, today’s knockoff is more of an ‘inspired’ version. This is the original version, ‘Sky’s End’ earrings, (photo credit: Anthropologie). It’s not available anymore, unfortunately, but it was on sale for $128. Did you fall in love? If so, follow the tutorial; this pair is actually very easy to make! 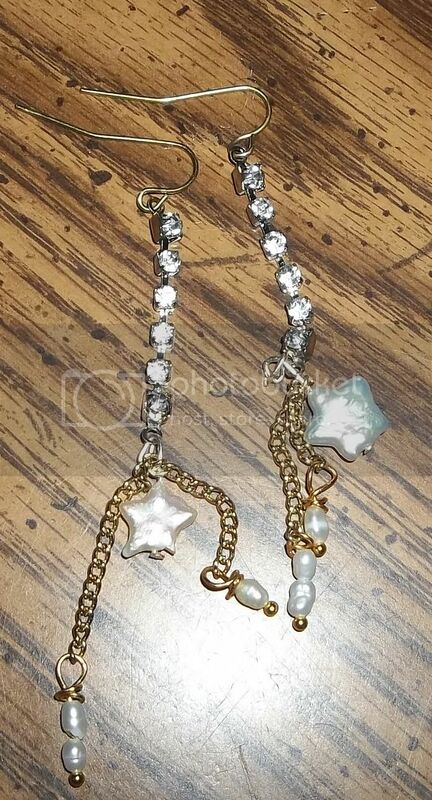 1) Place the rhinestone chain into the end clamp. 2) Fold over the prongs with flat-nose pliers. Repeat this for the other end of the rhinestone chain. 3) Thread the pearls to headpins, and bend the pins at 90 degrees angle. 4) Add the chain to one of the headpin. 5) Create a wrapped loop. Grasp the end of the headpin with round-nose pliers, and wrap it around the jaw of the pliers to create a loop. With the loop securely grasped with the round-nose pliers, grasp the tail wire with flat-nose pliers, then wind it around the main pin just below the loop for 2 to 3 times. 6) Cut off the excess tail wire with wire cutter, then squeeze down the tip so that no sharp edge sticks out. Repeat this for the other headpin. 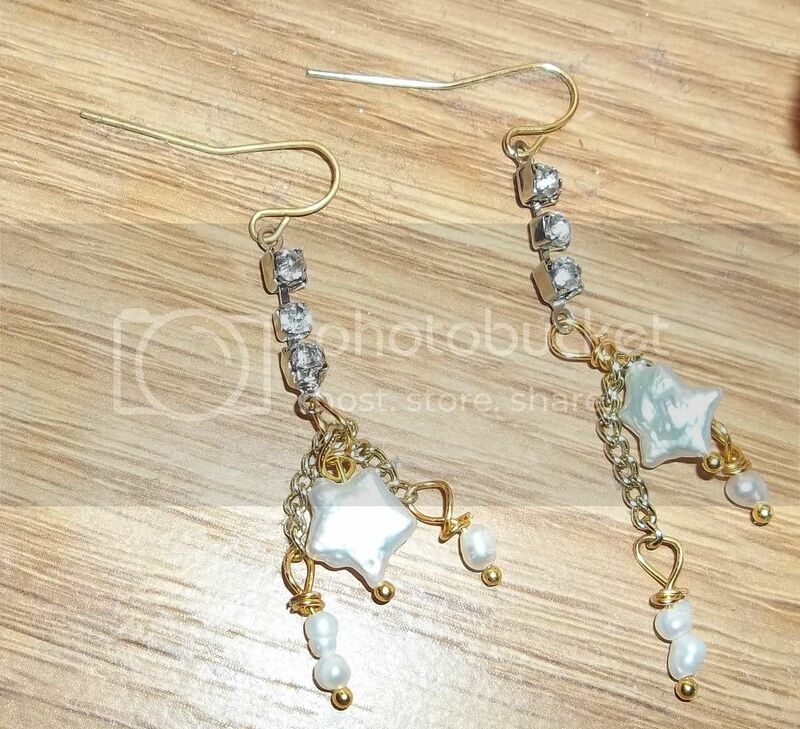 7) Thread the star-shaped pearl to the headpin, then bend the pin at 90 degrees angle. 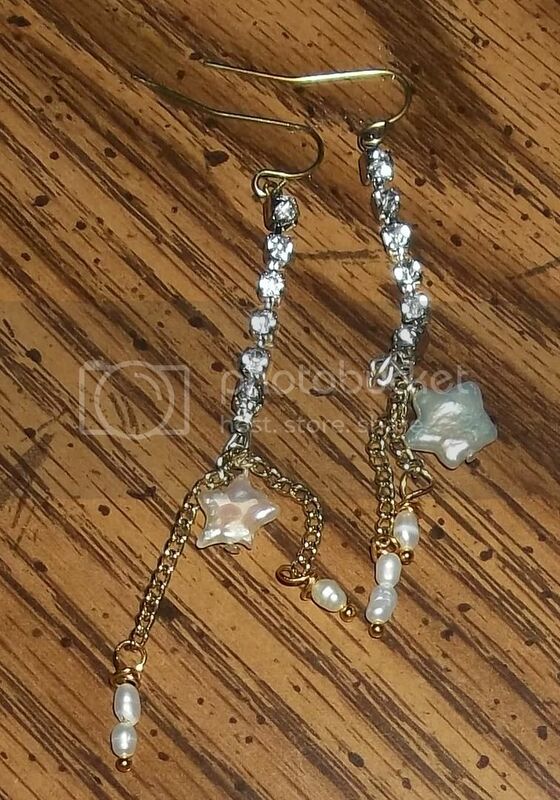 Add the rhinestone chain and 2 chains with pearls to the bent headpin. 8) Create a wrapped loop (the same way as step 5 & 6). 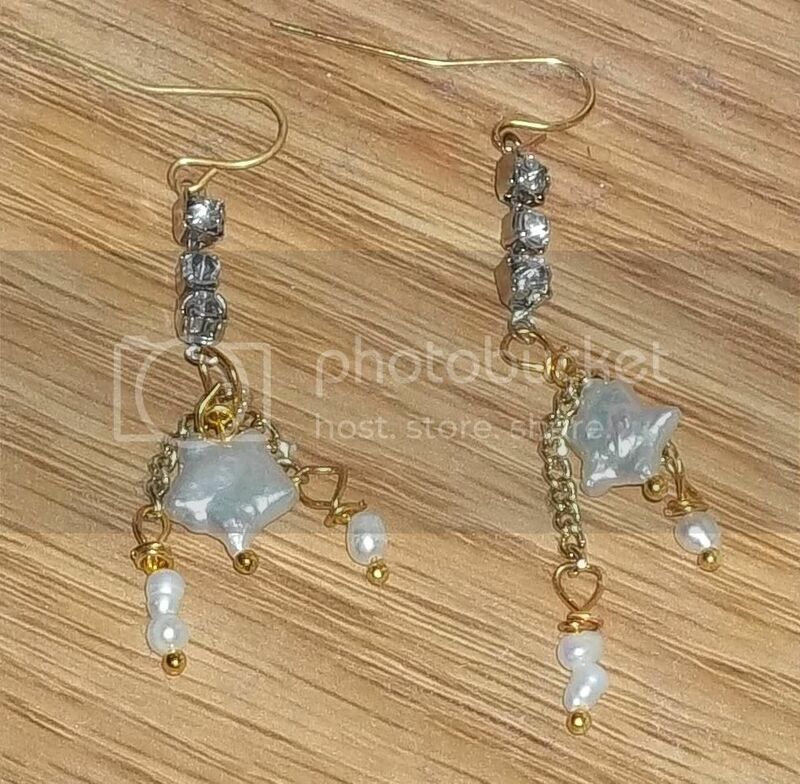 9) Attach the end of the rhinestone chain to the earwire. Repeat the process to make another earring, and you’re done! These star-shaped freshwater pearls are my favourite. They are not perfectly shaped, but that’s part of the beauty of freshwater pearls, I think. Shall I call it ‘Shooting Star’, or ‘Night Sky’s End’ (the original one is called ‘Sky’s End’, remember)? Anyways, I love how it turned out so much that I’m thinking of making a matching necklace :) Do I still want the original Anthropologie version? Yes, please! I think this version is even prettier than the original. Great job and thanks for sharing. Yes, Anthropologie jewelry just keep me drooling :) Thanks for stopping by, Debbie! Great way to use leftover cup chain. Thanks for sharing the project. I fall in love with Anthropologie jewelry too. Here are the pictures! I wore them to work the other night even and got so many compliments! I am completely in love with this pattern! Thank you so much for sharing with all of us! I bought all the stuff to try to make these today and I’ve made two pairs so far! I shortened the second one a little bit to make them not so dangly but I love both! Thank you so much for this tutorial! I’ll definitely take pictures and share them when I get my camera around! Awww, thank you Karen, you’re very sweet! Theirs are nice, pretty color, but I like yours WAY better!!! Yours look more classy and expensive. So pretty!